Feminism, much like art, is about perception. GUTSY: Taking the Fear Factor Out of Feminism is asking that you, the viewer, take a moment to consider your own perceptions about Feminism. Feminism isn’t stagnant nor can it be claimed by one group of people, feminism is an ever evolving process and it provides something for anyone willing to explore its concepts. Artists in the exhibition embrace, as well as challenge feminism, and what it means to be a feminist. The exhibition excavates and examines the many layers that make up what feminist art looks like today with a diversity of work, with everything from pieces that are feminist objects in and of themselves, to pieces that require a deeper look at artistic process and the hands behind their creation. And still other pieces are almost participatory in nature and require the viewer to consider invisible processes at play, gendered spaces and the effect of visual culture. 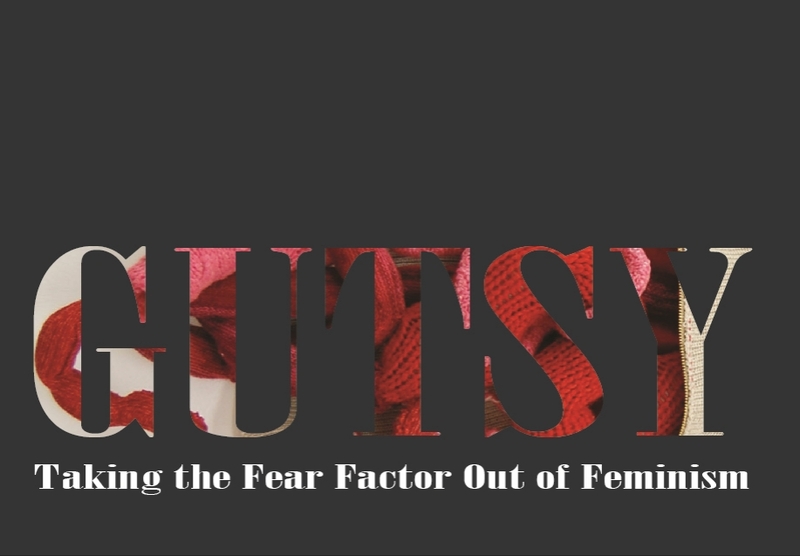 GUTSY: Taking the Fear Factor out of Feminism reacts against preconceived notions of the female and the definition of feminist, challenging the misogynist construction of ideal beauty and what it means to be a woman. Many artists use their bodies as the site of revolution and this is reflected in a number of works chosen for the show. For each artist and each person feminism has a slightly different meaning, and as a result of this fluidity of definition each is able to construct their own truths, defining ourselves and our practice. The Feminist Art Project-Baltimore recognizes the aesthetic, intellectual and political impact of women on visual arts and culture. We are a grassroots, non-profit arts organization which aims to be inclusive; supporting local, self-identified female artists, as well as men who recognize and promote Baltimore area women in the arts. As part of TFAP-B’s mission to support female artists and local organizations working to support women, 20% of each work of art that is sold will go to Power Inside. * Power Inside is a human rights and harm reduction organization that serves women and girls who are survivors of gender-based violence and oppression. Power Inside serves women impacted by incarceration, street life and abuse. They offer direct services, advocacy, leadership development and public education to help women build self-sufficiency, heal from violence, and avoid future criminal justice contact. *Please note, the artist retains 80% of sale, neither Gallery CA nor The Feminist Art Project - Baltimore will take commission on the sale of artwork during this exhibition. As an artist and educator Katie Bachler's work explores personal ideas of home, a concept she's exploring as part of her residency here in Baltimore at the Baltimore Museum of Art. Katie thinks a lot about people, and the relation of people to the places they call home, and how things come to matter. In her collaboration with The Feminist Art Project - Baltimore Katie will be co-jurying GUTSY: Taking the Fear Factor Out of Feminism and striving to contextualize Baltimore's own feminist history. In addition to her residency here in Baltimore, Katie is also the Director of Community Outreach and Programs for the Women's Center for Creative Work (WCCW) based out of Los Angeles. In her role at WCCW Katie liaises with the public on a physical level, going into neighborhoods and communities; networking with other people and groups who are interested in similar ideas. The WCCW is about to host it's third Women's Dinner, this one is about Intergenerational Feminisms! Allison Gulick is the Exhibitions Coordinator for The Feminist Art Project - Baltimore. Additionally she is the project coordinator for Station North's Community Support Art (CSA) project and works for the Office of Community Engagement at the Maryland Institute College of Art (MICA). She has her MFA in Curatorial Practice from MICA and a BA in Art History from the University of North Carolina at Asheville. Her previous curatorial work includes the exhibitions: Fan Brush: An Exhibition of Work by Matt Muirhead, Reloading the Canon: African Traditions in Contemporary Art; Invited: Celebration Station; Live and In Person: Globe Posters at MICA and The Meyerhoff Symphony Hall; and La Riqueza Del Pueblo: The Richness of the People. Allison has an addiction to coffee, chocolate, books, British period dramas, and she is an avid connoisseur of cats.